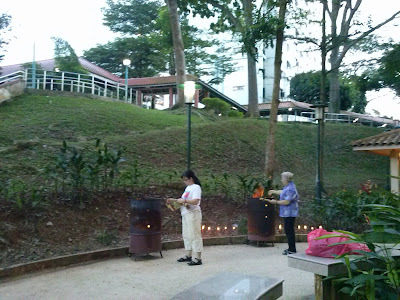 The smell of burnt paper in the air earlier in the month reminded me that it is Ghost Month or the Ghost Festival time in Singapore and the rest of Asia. I checked the internet and sure enough, the dates for 2013 is August 7 to September 4! The seventh lunar month in the traditional Chinese calendar is called Ghost Month! On the first day of the month, ancestors are honored with an offering of food, incense, and ghost money ie. paper money which is burned so the spirits can use it. These offerings are done at makeshift altars set up on sidewalks outside the house as in the above pic. The Gates of Hell are supposed to be sprung open to allow ghosts and spirits access to the world of the living. The spirits spend the month visiting their families, feasting and looking for victims! Those who believe this would actually avoid checking themselves into the hospital even if they have a needed serious operation during such an inauspicious time of the year for fear of trouble from these spirits or ghosts! How timely this event came along when I was writing my spiritual blog post earlier about another type of spirit or ghost that relates to Family History Work in our Church. This post is to cover interesting information about our 'Chong' Chinese family history that I have uncovered over the years of being inspired to do our family history work. The family name or last name in the west 'Chong' that we carry in Malaysia is not really using the official Hanyu Pinyin system of translating Chinese characters to Latin script. The Chinese character (张) in simplified characters or (張) traditional for 'Chong' in Pinyin would actually be Zhāng. So my full name in the east of 'Chong Sun Fu' using the family name as the first name instead of the western way of 'Sun Fu Chong' where the family name is the last name, would be spelled as Zhāng Shān Fú as in the Pinyin system or 张山福 in simplified Chinese characters. My given name 'Sun Fu' (山福)means Mountain of Luck. If I haven't already confused the western reader of this post enough, the family name of our ancestors in Indonesia where our immediate roots were discovered to come from is spelled as 'Tjong', Variation of this would be 'Tjoeng' as seen in some Chinese family names of friends I know born in Malaysia, where they are vaguely aware that their immediate or nearest ancestors are from Indonesia. 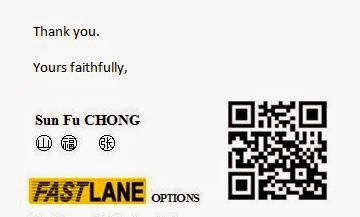 Being western educated and thoroughly aware of the 'given name' and 'last name' confusion between the West and the East as to which comes first when we have to write our full Chinese names in English, I would spell my family name in capital or block letters to be either CHONG Sun Fu or Sun Fu CHONG. I did this so that I could print just one set of standard name cards that can be used locally or for my international business travels to the West. This, however, is my own innovation where some may still not understand the symbolic meaning of my capitalized family name. I am waiting for the time when technology is more widely used by the masses where every name card would have a new QR code that when scanned by their smartphones or iPads will give an immediate internet link to some paragraphs of text to explain the meaning of what is intended. Click here, for example, to be led to a brief explanation of my Chinese name and a link to the profile of myself and the websites I have created. If my name card had a QR code, scanning it would quickly open up this same explanation the same way you clicked the link earlier. Get the idea of what I'm saying how technology can enhance the use of a small name card to carry more information? Either that or a name card may eventually become obsolete when two persons could just hold their smartphones to face each other, instead of the regular handshake greeting, to capture each other's QR code so that they have immediate possession of each other's contact information stored in their own webpages. So much for the technology of the future and let's carry on with our family history information. 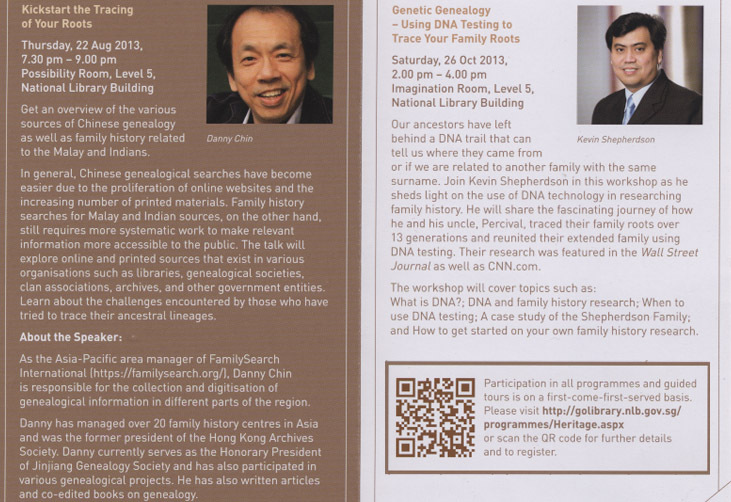 Coincidentally a brochure of a public exhibition and talks on tracing family histories held in the Singapore National Library that I attended on 22 Aug 2013 had a QR code seen in the above photo shot. My emails and name cards today do include a QR code too, as seen below, to clarify what's in a name or who's behind the name! It was fortunate that my great grandfather, Tjong Yong Hian and his younger brother Tjong A Fie had become rich and famous after leaving China to seek for their fortune in the country of Indonesia, in the city of Medan. It is through the legacy they had left behind that the historical records of our family and generations of names of our ancestors can be traced. The full knowledge of my rich and famous great grandfather and his brother didn't really come to me until my adult years. My father didn't talk much about his ancestors when I was young and the early stories that I had heard from him or my mom was that he started off life poor as he did not claim any rightful inheritance from the family in Indonesia as he was born in Penang island in Malaysia through my grandmother who was one of the plural wives of my grandfather. I guess my father never really shared with us any of the colorful history of his father and wives he had and I grew up as the youngest in a family of 7 children with an awareness of the hardships my older siblings had all gone through in their early years. 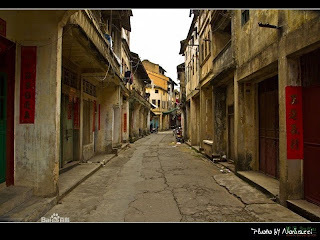 My father started off with a tough time in Penang, poor and bullied by neighborhood kids and without a father as his father, Tjong Kung-We (张公伟 ) had died early from a tragic accident when the roof of his house collapsed and killed him instantly when he returned to China. He had even worked pulling a rickshaw, a two-wheeled passenger cart which was a common mode of transportation in the early days. His lucky break came from working with the British government in the Survey department where he obtained a scholarship to England for his education to become eventually a qualified Chartered Land Surveyor. By the time I was born, we had lived in a large comfortable but old British built government bungalow with a large garden in Kuala Lumpur where he had become a division one officer of the KL survey department. Relatives on my father's side were almost nonexistent. He had only 1 sister and she died young from leukemia leaving only a son who was my only cousin from my father's side. There was a distance of age between us as he was as old as my oldest brother and sister. I had more uncles and aunties as well as cousins from my mother's side with the Cheah 謝 surname. So the roots of the Chong clan was not really known to me even though great grandfather was a rich and famous man with his younger brother in Medan Indonesia. While I was serving my mission in Malaysia in 1980-82, it was my father who cut out the Star Paper to show me the article about Queeny Chang's book on our ancestry. I'm sharing in this post the interesting info that I have learned about our ancestry that started just with that one contact with the author of the book who was really my grand aunt, being the daughter of my great grand father's younger brother or the cousin of my grandfather Tjong Kung-We who died early. Her father was Tjong A Fie, the younger brother of my great grandfather, who also became rich and famous together in South East Asia with my great grandfather, based in Medan Indonesia. Through her, I was led to receive a copy of our family genealogy book (族谱- zu pu) which gives me enough names of ancestors to translate from classical Chinese to last a lifetime! The first Zhang surname was supposedly given by the legendary emperor Huang Di (2697-2595 BC) to one of his children who invented bows and arrows. The Chinese character pronounced Zhang is composed of the symbols for 'bow' and 'long'. 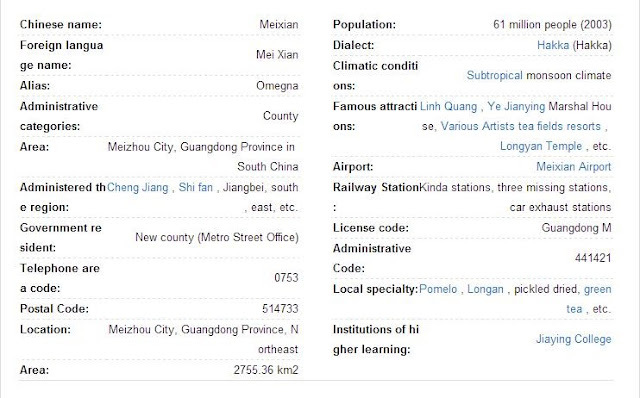 Zhang has now become one of the most popular names in China today as I have read. I had learned that the Zhang family came from the Sung-kow or 'Sou Kou' village in China in the province of Kwangtung or 'Guangdong'. Our forefathers were originally from central China. Due to droughts, floods, and incessant wars, they had drifted from one place to another until they reached the coast. When they finally settled in the provinces of Kwangtung and Fukien on the east coast, they were treated as visitors by the local inhabitants. Fortunately, in the continued search for my roots recently, I came across a video clip of my great grandfather that was only published on youtube early in 2013. Click here if the above video clip cannot be viewed. From the above video, the name of Budihardjo Chandra emerged as new knowledge to me of a living descendant of Tjong Yong Hian, a great-grandson similar to my position in the family history or genealogical records. On further research on the internet social media of LinkedIn and Goggle+, I found his name and sent email or messages to him of my desire to connect to him as a Tjong Yong Hian descendant also. The video also revealed that Tjong Yong Hian, my great grandfather, was born into a Hakka family in the county of Meixian in Southern China. Talking about technology again, I used the Google Translation program to get the Chinese name of the town as 梅县 Next was to use the Chinese search engine Baidu to find information of the county. Below is an extract of some data of the county in Chinese and using Google Translation, I captured another extract of the translation in English. From the data above, we can see the town of Meixian is really a big city now even in 2003 with a population of 61 million people which is almost triple Malaysia's population! (Post-development : 61 million is most likely a misinterpretation) To find the more accurate location of where he was born or his family home, I would need the village where he was born. Fortunately, through the letters of the half-brother of my father referred in another post, Tjong Tung Mau whom I had corresponded with after we first met in Kuala Lumpur in April 1984, I got to know the village name was Song Kou and more accurately in Chinese 松口 which means relent or not to be stubborn and in some translation 'Open one's Mouth'. A further search in the Baidu search engine found the website of the village Sōng kǒu here. More photos can be found in the facebook album here. As a side note, I find the meaning of the village Song Kou as relent or 'Open one's mouth' quite interesting as I seem to have the philosophy of being hard to my children especially in their teenage years, not to be stubborn in their repeated actions that are detrimental to their future like getting hooked to computer games or videos, and would always allow them to respond by challenging me in a debate of words ie 'Opening their Mouths' to defend their case of continuing. However, I remind them that this can only be done under the conditions that they must be based on facts and not purely anger of throwing rude or ugly names at me which I will NOT ALLOW as according to our Chinese race which we belong to, RESPECT is demanded of the younger to the Elder. I reminded them that I had shown this similar respect to my Father and also my Brothers who are all older than me where I may respond with humble words and even tears some times, but never throw angry caustic hurtful words back to them in my entire life, even if I had felt at times they had wronged me or misunderstood me! From this experience from family and later years from Church, I became a man that never really learned to hate anyone, even when in life they have cheated me in money, hurt me emotionally or may have treated me unfairly in business, church or family. I, therefore, WILL NOT ALLOW my children to do this to me i.e. to show disrespect to me or anyone older than them, by the nature of my upbringing. However being brought up in more modern times, I do allow them to express anger or frustrations in what I call 'Family Drama' that may be disturbing for anyone who may not have faced loud conflicting situations in life proactively by 'opening their mouths' and may always have just kept quiet. I have therefore chosen a Optimal situation where I do allow them to 'Open their Mouths', be even angry to let out their stress or emotions etc but adopting a humble stance to a Father who is older and more experienced than them even in the field of computer technology that they play with, so that there can be open communication. In this way, I can read and study their psychology or maturity of their mental aptitudes or attitudes and know what needs to follow up to nurture them to adulthood to be citizens who will be contributors to society for the better rather than the worse! As they are brought up under a Church that my wife and I had chosen freely to join as separate individuals before we knew each other, and agreed mutually when we were married that we could trust the LDS Church to give them the optimal culture to nurture them to adulthood, I reminded them at times about respecting the Office of the Church to follow the instructions of say a Bishop/President of a Ward or Branch of the Church. They may not be perfect men in the eyes of members as I am not a perfect father either in the eyes of my children, but we learn to respect the office of the person called so that there may be order and peace in the Church or a Family. I did highlight to the children in times of conflicts with me that there is one big difference in a Family compared to the Church system. Bishops/Presidents are released after serving for a good number of years but a Father's calling is never theoretically released even though 21 is the legal age of a child to become independent i.e. to mean he now becomes responsible for himself as an adult to face consequences of his own actions. Reason being, for example, a Father and Son relationship can never change as it was created by birth and if birth and the purpose of life can be regarded as sacred or even spiritual, if this bond is broken, detrimental effects may occur to the peace of communities and societies in our world. 10 And he also spake unto Lemuel: O that thou mightest be like unto this valley, firm and steadfast, and immovable in keeping the commandments of the Lord! 11 Now this he spake because of the stiffneckedness of Laman and Lemuel; for behold they did murmur in many things against their father, because he was a visionary man and had led them out of the land of Jerusalem, to leave the land of their inheritance, and their gold, and their silver, and their precious things, to perish in the wilderness. And this they said he had done because of the foolish imaginations of his heart. This I never used it against them for it would be unwise to judge a son with scripture even though as a Father, it was revealed to me in a special blessing that I received from the Patriarch of our Church the following gift, "...as you continue your studies of the scriptures, your tongue shall be loosened and you shall never be confounded by those in opposition." For teenage children, I never had to show their foolishness of incomplete knowledge/experience and thus inaccurate interpretations of their young minds with ancient inspired scriptures as I can simply confound them with the simple reasoning and common sense logic that any Father or teenage child should have. If anything, the unstable irrational behaviors of teenagers as a half child half adult is the source of their troubles and from brain studies, some don't even stabilize or become rational even as old as in their mid-20s! Patience is the virtue fathers must have to raise boys to become men but not without constant coaching, instructions and exercises to help them develop self-discipline and abilities to focus in order to achieve set goals. 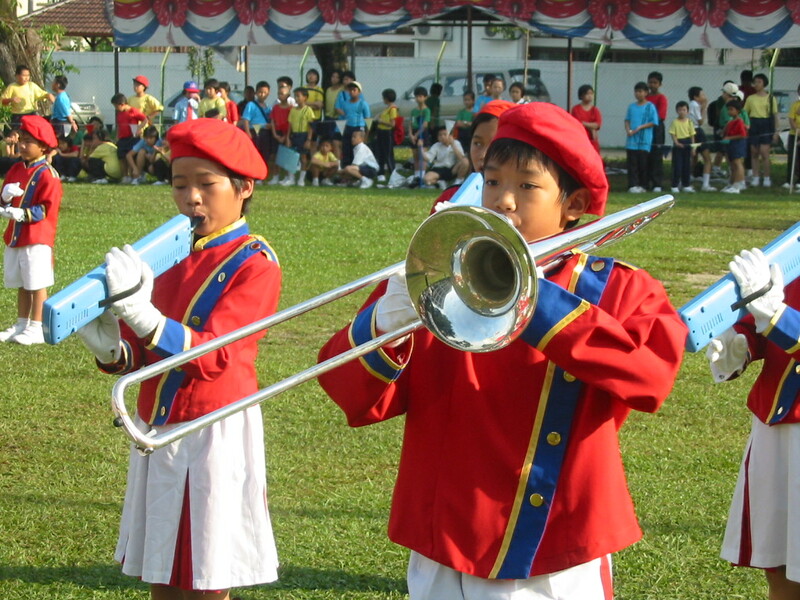 In Singapore, parents have the assistance of the government who require all young men of age to be enlisted into the Armed Forces of the country for 2 years. 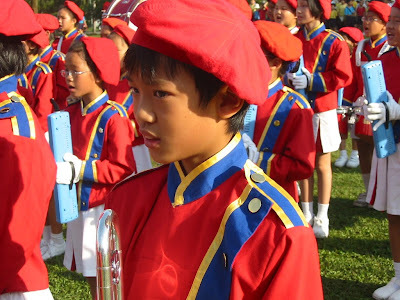 The first in our family to do so recently is Woon Shuan. His first day of entry as a recruit has been recorded here. I had an interesting time learning more Chinese from my deceased wife's brother Clayton whose surname is also spelled like ours as a Chong though the rest of the family members are a Thong. All these confusion of names in English were sometimes simply the mistake of a non-Chinese nurse recording the family name in a government hospital who might ask the mother what is your family name and she wrote down in English how she thought it sounded like. Without reference to recorded names of previous children born or the father's actual name who may not be around at birth, they ask the mother and therefore the nurse just wrote it on permanent documents the way it sounded to them. This was what I had learned in Malaysia, where even a historic hero like Hang Tuah from the Sultanate of Malacca, considered to be one of history's greatest silat masters, is now doubted whether he really existed or even if he was a Malay as recorded in school textbooks and made into movies. 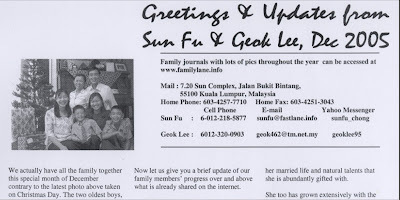 Read the details from the Star Online news of Sunday, January 22, 2012, here. Greater research in Family History of Hang Tuah and his four comrades Hang Kasturi, Hang Jebat, Hang Lekir, and Hang Lekiu would be certainly useful to establish what is the truth. Now back to the Chongs. Clayton Chong in our Father-Son trip to the Gold Coast in Australia in June 2013 spent several nights sharing with me his knowledge of Chinese history and politics. He highlighted a Chinese character 孝 (Xiào) to me and explained that it consists of two sets of characters, father at the top and son at the bottom, which means filial piety and how it is written is shown here. 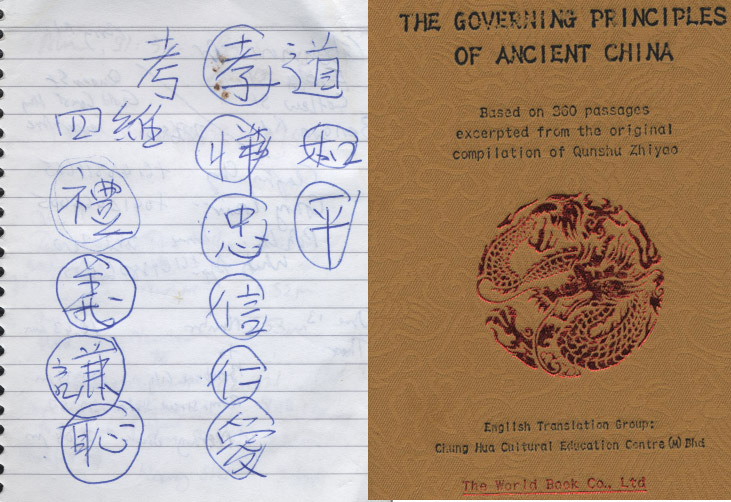 On the left, you see a scanned copy of the key Chinese characters he wrote on my notebook. 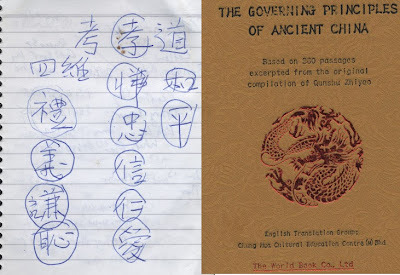 On the right is a hardcover book he presented to me concerning The Governing Principles of Ancient China. He summarized that filial piety was an important element that kept China united until today and is the underlying strength of the nation and all other countries could learn from it to save themselves and also the world. It may be for this reason that the contents of this book can be read for free online here. Singapore has many interesting little corners in the small island made accessible by a very efficient transport system. Often times meeting someone is a simple decision of which MRT station to meet at and from there you and the party can wander to a nearby corner for a meal or a drink to socialize or transact! I recently met a US visitor shuttling on a flight between New York, Singapore and Jakarta for a quick lunch, pleasant update chats and a short transaction at a building near the Tanjong Pagar MRT station. Such is the efficiency of Singapore. Even as a lifetime visitor of Singapore, the small island still has many small corners for me that I would like to visit and wander around with fascination. Once such corner is the Red Dot Design Museum on 28 Maxwell Road, nearby our lunch location. After the meeting was over, I was somehow drawn toward this building that I've visited before. This time, however, I walked a different street toward the building known as Peck Seah St that was an approach from the MRT station toward the back of the building. As I was walking along the street on the corridor of this building on number 20 Peck Seah St, something caught my attention. I couldn't tell what was the name of this building as I was walking too closely along its outer corridors and missed the big name on the face of the building above me. However, my eye caught these two signboards with the distinct name of Meizhou on the outside wall of the building. 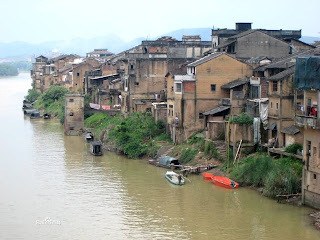 Meizhou was the name I had learned of recently to be the county of my ancestral village as described earlier in this blog post! I immediately walked back to the main glass door of the building and opened it to see, on the left of the main entrance hung above a small door that led to an office room, a familiar photo of the father and former prime minister of Singapore, Mr. Lee KuanYew. On talking to a friendly and helpful staff of the office, I learned that this building was the headquarters of all the Chinese clans in Singapore and Khek or Hakka was the dialect or clan that Lee Kuan Yew was part of, the same as my ancestors. I was informed that the Meizhou people from China had formerly used the building as their office and I was invited to their trade meeting at the Shangri-la hotel on 17th October. More to be reported on this later. The friendly staff turned out to be a key person to eventually help me to find my ancestral village in China explained in this post. 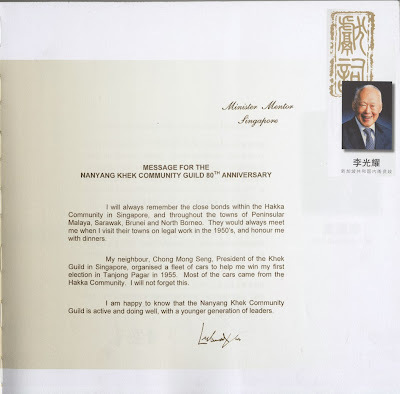 I was presented with a copy of a souvenir publication of the Guild's 80th Anniversary where the above message from the Minister Mentor of Singapore was extracted from. 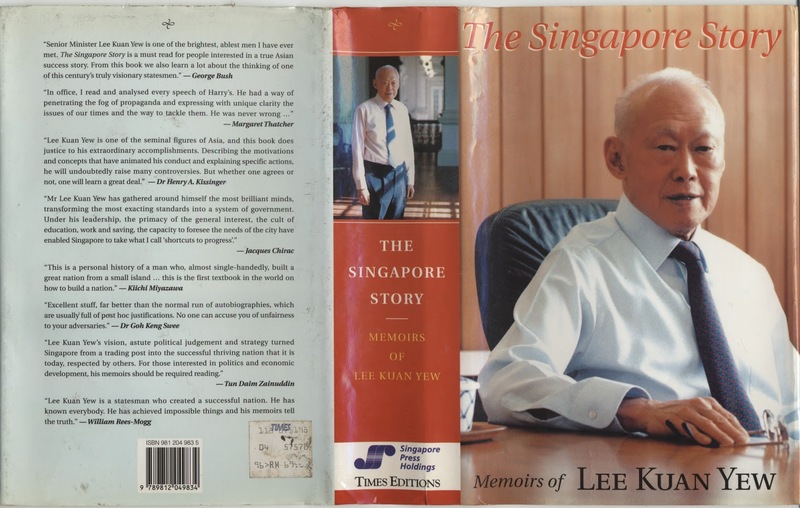 'I was born in Singapore on 16 September 1923, in a large two-storey bungalow at 92 Kampong Java Road. 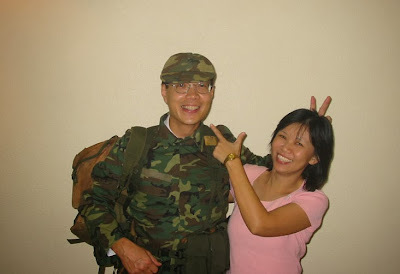 My mother, Chua Jim Neo, was then 16 years old. My father, Lee Chin Koon, was 20. Their parents had arranged the marriage a year previously. Both families must have thought it an excellent match, for they later married my father's younger sister to my mother's younger brother. My father had been brought up a rich man's son. He used to boast to us that, when he was young, his father allowed him a limitless account at Robinsons and John Little, the two top department stores in Raffles Place, where he could charge to this account any suit or other items he fancied. He was educated in Engish at St Joseph's Institution, a Catholic mission school founded by the De La Salle Brothers in 1852. He said he completed his Junior School Certificate, after which he ended his formal education - to his and my mother's eternal regret. Being without a profession, he could only get a job as a storekeeper with the Shell Oil Company when the fortunes of both families were destroyed in the Great Depression. My family history in Singapore began with my paternal great-grandfather, Lee Bok Boon, a Hakka. The Hakkas are Han Chinese from the northern and central plains of China who migrated to Fujian, Guangdong and other provinces in the south some 700 to 1,000 years ago, and as latecomers were only able to squeeze themselves into the less fertile and more hilly areas unoccupied by the local inhabitants. According to the inscription on the tombstone on his grave behind the house he built in China, Lee Bok Boon was born in 1846 in the village of Tangxi in the Dabu prefecture of Guangdong. He had migrated to Singapore on a Chinese junk. Little is known of him after that until 1870 when he married a Chinese girl, Seow Huan Neo, born in Singapore to a Hakka shopkeeper. In 1882 he decided that he had made enough money to return to his ancestral village in China, build himself a large house, and set himself up as local gentry. His wife, however, did not want to leave her family in Singapore and go to someplace she had never seen. According to my grandfather, who was then about ten, the children and their mother went into hiding with her family in Ah Hood Road. Lee Bok Boon went back to China alone. There he married again, built his large house, and duly bought a minor mandarinate. He had a portrait done of himself in mandarin robes, which he sent to Singapore, together with another painting of an impressive-looking Chinese traditional-style house complete with courtyard and grey-tiled roofs. The painting of the house has been lost, but of my great-grandfather still exists. My grandfather, Lee Hoon Leong - whom I addressed as Kung or "grandfather" in Chinese - was born in Singapore in 1871, and according to my father was educated at Raffles Institution up to standard V, which would be today's lower secondary school. He himself told me he worked as a dispenser (an unqualified pharmacist) when he left school, but after a few years became a purser on board a steamer plying between Singapore and the Dutch East Indies. The ship was part of a fleet belonging to the Heap Eng Moh Shipping Line, which was owned by the Chinese millionaire sugar king of Java, Oei Tiong Ham. In between his travels, he married my grandmother, Ko Liem Nio, in Semarang, a city in central Java. There is a document in Dutch, dated 25 March 1899, issued by the Orphan's Court in Semarang, giving consent to Ko Liem Nio, age 16, to marry Lee Hoon Leong age 26. An endorsement on this document states that the marriage was solemnized on 26 March 1899. My father was born in Semarang in 1903, in Dutch East Indies. But he was a British subject by descent because his father - Kung - was from Singapore. Kung brought his wife and baby son back to the island for good soon after the child's birth. His fortunes rose as he gained the confidence of Oei Tiong Ham, who appointed him his attorney to manage his affairs in Singapore. Kung told me how he was so trusted that in1926, on his own authority, he donated $150,000, then a princely sum, from Oei's funds towards the foundation of Raffles College. ....Chua Kim Teng had no formal English schooling nor had he associated with British sea captains and Chinese sugar millionaires. He was born in Singapore in 1865, into a Hokkien Chinese family that came from Malacca. He had grown wealthy through hard work and frugal living, saving his money for judicious investments in rubber and property. He married three times. His first two wives had died and the third was my grandmother, Neo Ah Soon, a large, broad-shouldered Hakka from Pontianak in Dutch Borneo, who spoke the Hakka dialect and Indonesian Malay. When she married Chua, she was a young widow with two children by her first husband, who had died soon after the younger son was born. She bore Chua seven children before dying in 1935. He died in 1944 during the Japanese occupation of Singapore. ....When I was born, the family consulted a friend knowledgeable in these matters for an auspicious name for me. 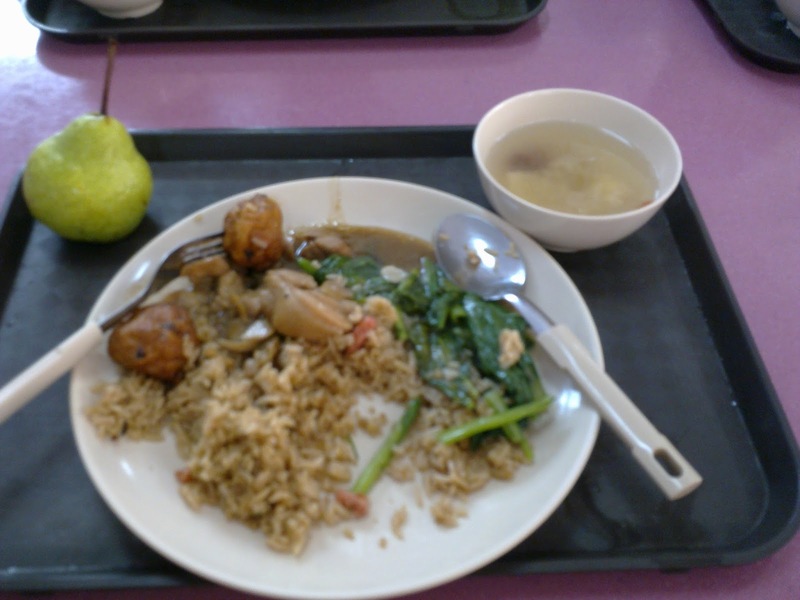 He suggested "Kuan Yew", the dialect rendering of the Mandarin guang yao, meaning "light and brightness". But my grandfather's admiration for the British made him add "Harry" to my name, so I was Harry Lee Kuan Yew. 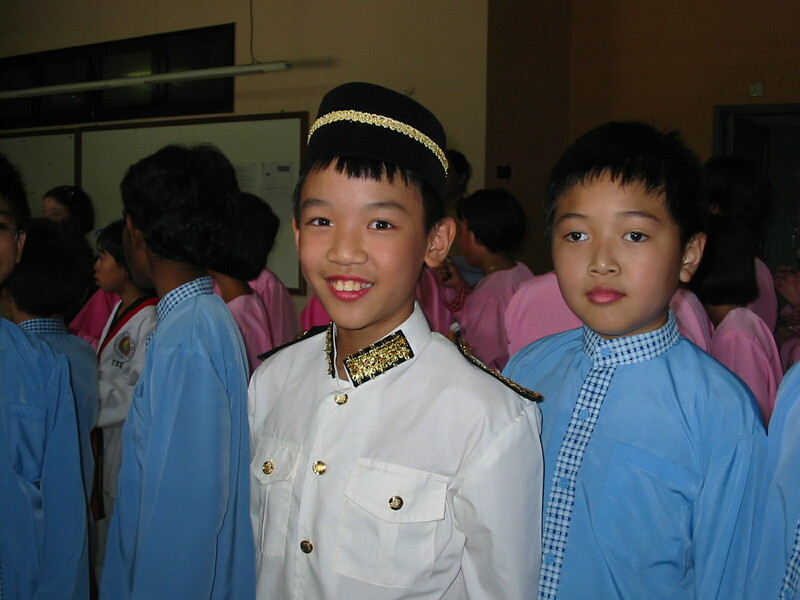 My two younger brothers, Kim Yew, and Thiam Yew, were also given Christian names - Dennis and Freddy respectively. At that time few non-Christian Chinese did this, and at school later I was to find myself the odd boy outwit a personal name like "Harry". When my youngest brother, Suan Yew, was born in 1933, I persuaded my parents not to give him a Christian name since we were not Christians. A family tree chart of Lee Kuan Yew can be viewed here or a simplified family tree by wiki found here. Another corner of the city that I had visited in Singapore recently that is near the Bugis MRT station is the National Library of Singapore. 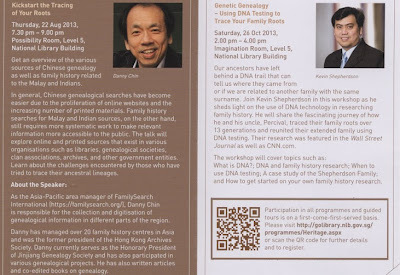 I was there earlier a month ago for a talk by Danny Chin on researching family histories as per the brochure with the QR code found at the top of this post. This time I used the elevator to head to Level 10 of the building where even the door of the elevator was publicizing the exhibition with the theme of ROOTS, Tracing Family Histories. This free admission exhibition had been opened to the public since 26 July 2013 and when I was here for the talks earlier in August, I didn't have time to visit then. I noted that it would last for close to a 7 month period of time to end on 16 February 2014 so I decided I could come back again for another visit to the National Library. This time around, the exhibits captured my attention for several hours and I have an album of photos to share here. The map shows Singapore as an important port of call for the maritime silk route in the old days. It was not just a link for business but as people moved with the economic flow, it has become a central meeting point for people from surrounding countries. This converging point is useful for family history research work too. 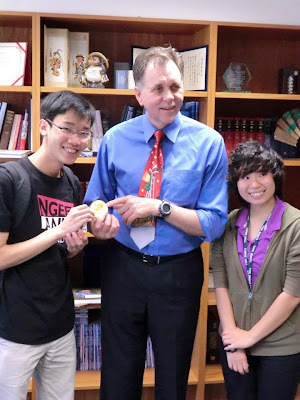 As shared in this blog post so far, one can see that I have had several inspiring experiences in Spore. I had found that the Family History Centre of the Church in Singapore is more conversant in Mandarin to help translate the old classic Chinese language of our family records. Also in one of my business meetings in Singapore, I chanced to meet with a couple from Jakarta who has a similar interest in family history work. From this meeting, I could seek their help to trace for a cousin that I have never met but got to know his name in the video of Tjong Yong Hian posted earlier. The public youtube video revealed his name as Budihardjo Chandra who apparently lives in Jakarta. Chinese in Indonesia do not keep their Chinese name but need to adopt and Indonesian local name which explains why there is no Tjong or Chong or Chang in his surname. I hope more can be reported from this contact in the near future on the progress of the search for my ancestors as well as current living relatives in the region. From my meeting at the Nanyang Khek Community Guild earlier where I was informed of this meeting, I showed up at the hotel and joined in the investment forum meeting. The one of the left was a book on Investment and Leisure guidance which gave an overview of Meizhou City, stating it to be either the final settlement place of south migration of Hakkas or the main place of departure of Hakkas spreading over the world since Ming and Qing dynasty. Apparently, it is the soul garden for Hakkas all over the world, therefore, is called as "Capital of Hakkas in the world." Since the revolution of 1911, the city had produced 25 academicians of the Chinese Academy of Sciences and Chinese Academy of Engineering, over 250 university presidents and over 470 generals. Meizhou is the ancestral home of Lee Kuan Yew, former prime minister of Singapore, Yingluck, current prime minister of Thailand and Thaksin, former prime minister of Thailand. It has over 3600000 overseas Chinese living in Hong Kong, Macau, Taiwan and other countries covering more than 70 nations and regions. There was a line-up of speakers including the Minister Counsellor of the Embassy of the People's Republic of China in Singapore and Counsel of the Department of Foreign Trade and Economic Cooperation of Guangdong Province. The meeting was quite productive as I managed to meet with and exchanged name cards with some businessmen from Guangdong whom I can follow-up with, local Singaporean businessmen too who have visited there and are familiar with the culture and geography of the area, to help me get more prepared before I fly over. I even got the name card of the First Secretary (Economic & Commercial), FANG Jiawen, of China's Embassy, noticing that his name card had his family name spelled in capital letters, the same way I have it in mine! He is pictured above as the 3rd person from the left in the first front row wearing glasses. A nice buffet luncheon was prepared for all forum participants after the meeting was over. A very impressive and effective way indeed of the Chinese government to connect overseas Chinese businessmen together with their own. To be continued...... at Family History Part 2 on the Cheah ancestry by clicking here. Plus his years of gymnastic training to strengthen and flex his body? Don't you agree that he looks good in any uniform? Bet he wanted to look just as good as Dad when he was drafted.......was Dad ever in the army before?? hahaha This will definitely be part of the theme for this year's Never Ending Christmas Story in December. 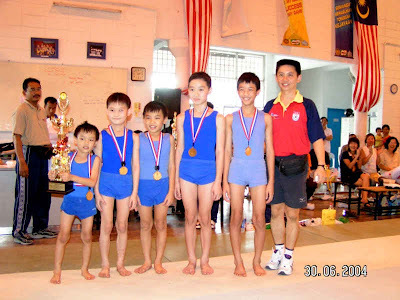 Yes Shuan, the S Boy, S for Steady but not Super, seen on the far right of the above photo would never have imagine at that time that he would one day be drafted into the Singapore army for National Service (NS) but nevertheless would have been well prepared. The reason is everyone was still living in Malaysia then except for Fei our oldest girl who was studying in BYU Hawaii. ...not forgetting winning competitions and paid trips to colleges overseas in Australia and the USA as well as community service trips to the Philippines. 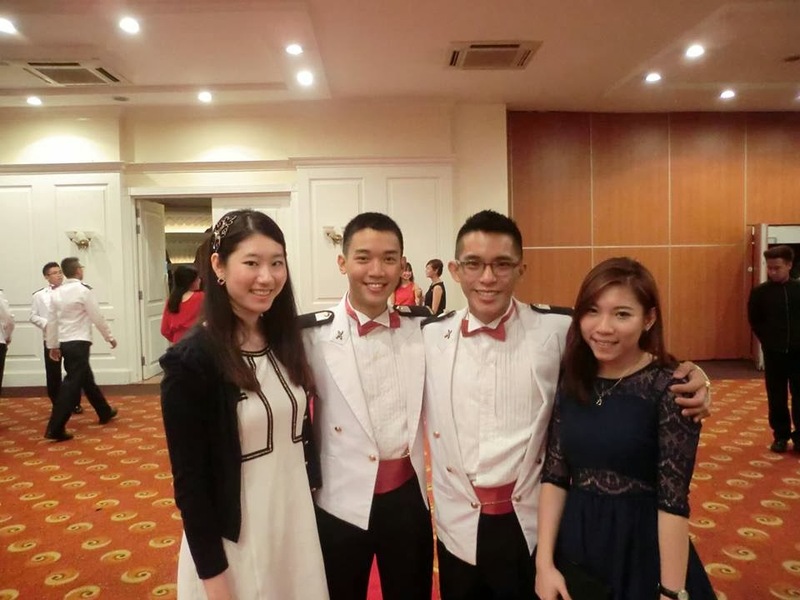 When he was in his college level, he knew the time would soon come when the 'rubber rubs the concrete' where he would be called to serve National Service in Singapore for 2 years, the consequence of being a permanent resident in Singapore. 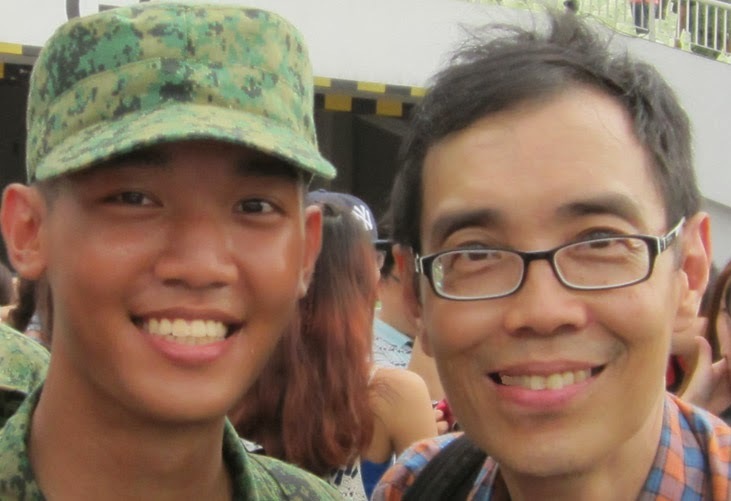 He will report to Tekong tomorrow morning and is allowed 5 members of the family to accompany him to tour the training site and facilities for all the new National Service recruits! What are the thoughts of Dad on this major event of his son in Singapore? Well after Mom passed away in Nov 2012, Dad was left with 3 remaining boys in Singapore to take charge of as the oldest boy Han, on the far right of the above photo, was on a mission in the UK Manchester area. 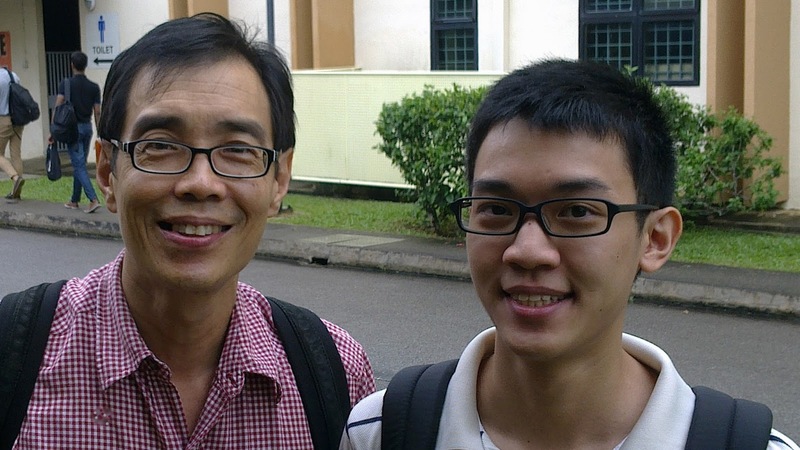 The situation became a greater challenge when Dad's application to the ICA for a long term stay in Singapore was rejected despite having a support appeal letter from the MP for Tanjong Pagar GRC(Buona Vista), Mr Chan Chun Sing. I had by the start of the new year exceeded the max 60 days in Singapore for the past 90 days period of time that I could remain in Singapore. This is when Dad's favorite dictum kicked in, ie "When the Going gets Tough, the Tough gets Going!" Even with all the support of family and friends, I am ultimately the Father of the family and I was in charge. I prepared them mentally and helped the boys understand that Dad running the home now is not quite like Mom. What I really meant was that we got to get organized and while Mom could be soft as a woman and also that she was stricken with cancer for 7 years before her passing away, Dad though a loving man at heart is still a Man and the boys need to learn how to be a Man under me. I felt some self discipline needed to be instilled in the home where each boy or part Man part Boy, for those older in teenage years, needed to learn his duty in the home. While their mother would sacrifice much to clean house, cook, wash etc etc etc after her maid had left home to be married in Indonesia, it was time for them to become self reliant, something that I felt I could teach/instruct as an independent professional entrepreneurial consultant for over 25 years. Nevertheless, dealing with mid to older teenage boys is not an easy task. Besides I had to shuttle back and forth between Malaysia and Singapore. My first initiative was to appoint a President in terms of civil position to be in charge in the home when I was away and that would be Shuan the oldest at home. In military terms he would be a Captain of the team but I would run the home in a civil way and empower the President to only give instructions to the younger two but not to render punishment to them for failure to obey, lest he becomes an enemy brother to them which I did not desire. But any wrath would come from where the buck stops and that is me the Father and in military terms, the General. The word I learnt early in my years of parenthood is to be 'Assertive' which meant the children will know that the Father means business when he gives them a reminder or two to follow up on an instruction from him. The President Shuan, had done a great job to care for the home, doing much of the administration of bill payments and upkeep of the house and the boys were told to follow his instructions as the President but any failure on their part to follow his instructions will be reported to me and only I would have the right to take any disciplinary action accordingly. So my thoughts as Shuan goes to the army is that I believe, he will now learn how in the military that when the going gets tough, the tough gets going. Tough not just in terms of physical endurance but the fact that the system of communication or commands must be loud and clear and no one in the team will be allowed to let the others down. He will have to be listening to more than assertive lance corporals or corporals etc and one day may be himself be promoted to those higher positions to become the more than assertive leader in the military. 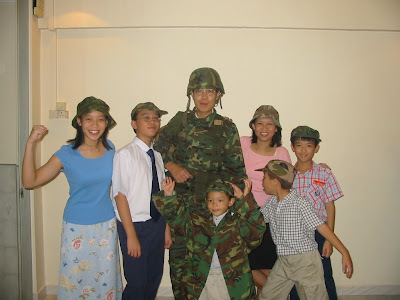 For that purpose I believe the National Service training in Singapore will be good for Shuan to help him balance his skills in leadership with whatever else he has learnt from our Church culture. Build me a son, O God, who will be strong enough to know when he is weak, and brave enough to face himself when he is afraid; one who will be proud and unbending in honest defeat, and humble and gentle in victory. Build me a son whose wishes will not take the place of deeds; a son who will know thee - and that to know himself is the foundation stone of knowledge. Then I, his father, will dare whisper, "I have not lived in vain!" 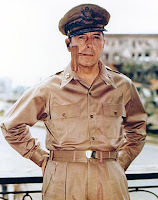 General of the Army Douglas MacArthur (26 January 1880 – 5 April 1964) was an American general and field marshal of the Philippine Army who was Chief of Staff of the United States Army during the 1930s and played a prominent role in the Pacific theater during World War II. He received the Medal of Honor for his service in the Philippines Campaign, which made him and his father Arthur MacArthur, Jr., the first father and son to be awarded the medal. He was one of only five men ever to rise to the rank of General of the Army in the U.S. Army, and the only man ever to become a field marshal in the Philippine Army. From 1919 to 1922, MacArthur served as Superintendent of the U.S. Military Academy at West Point, where he attempted a series of reforms. His next assignment was in the Philippines, where in 1924 he was instrumental in quelling the Philippine Scout Mutiny. In 1925, he became the Army's youngest major general. He served on the court martial of Brigadier General Billy Mitchell and was president of the American Olympic Committee during the1928 Summer Olympics in Amsterdam. In 1930, he became Chief of Staff of the United States Army. As such, he was involved in the expulsion of the Bonus Army protesters from Washington, D.C. in 1932, and the establishment and organization of the Civilian Conservation Corps. He retired from the U.S. Army in 1937 to become Military Advisor to the Commonwealth Government of the Philippines. In November last year, this man, Mr Chan Chun Sing, a member of parliament for the Tanjong Pagar GRC dropped by at Mom's wake at Commonwealth Drive to offer his services if needed by the family. A week later I was brought to meet him at a Meet-the-People Session (MPS) where Shuan became my offical sponsor as a permanent resident for my application to the ICA Immigration and Checkpoints Authority of Singapore for a long term visit pass on the island state. Tonight, realizing it was a Monday night when they hold their weekly MPS session, I chanced to go there by myself, as Shuan was busy with his National Service preparation, to have a further follow-up on my application to the ICA. I did get to meet Mr Chan again who realizing Shuan was now starting his NS gave a few words of advice. He suggested that Shuan should do his best to climb up the ladder while in NS to higher ranks or in short be a 'good boy' or stay out of trouble as he felt that his good performance while in the NS will be recognized by the government authorities considering my visa application! 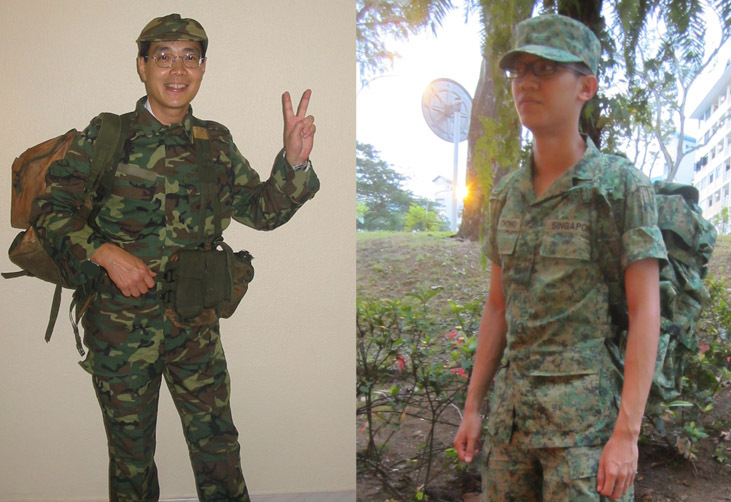 It is interesting to note the military career that Mr Chan had before he became a member of parliament. He served in the Singapore Army from 1987 to 2011. 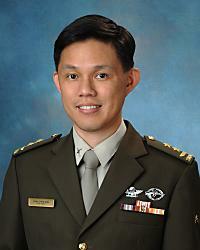 His appointments included Commanding Officer of the 2nd Battalion, Singapore Infantry Regiment (1998-2000), Army Attaché in Jakarta (2001–03), Commander of the 10th Singapore Infantry Brigade (2003–04), Head of the Joint Plans and Transformation Department (2005–07), Commander of the 9th Division / Chief Infantry Officer (2007–09), and Chief of Staff - Joint Staff (2009–10). 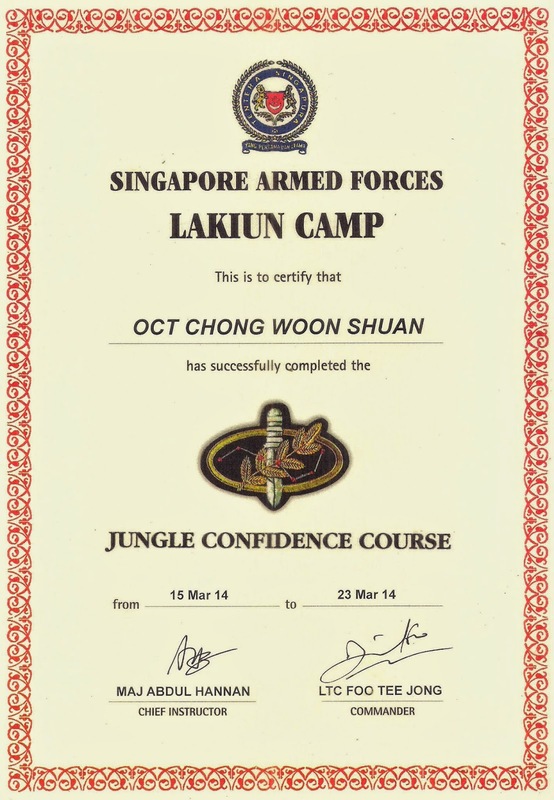 He was appointed the Chief of Army on 26 March 2010 (replacing Major-General Neo Kian Hong). He left the Singapore Armed Forces on 25 March 2011 in order to stand for Parliament (and was replaced as Chief of Army by Brigadier-General Ravinder Singh). 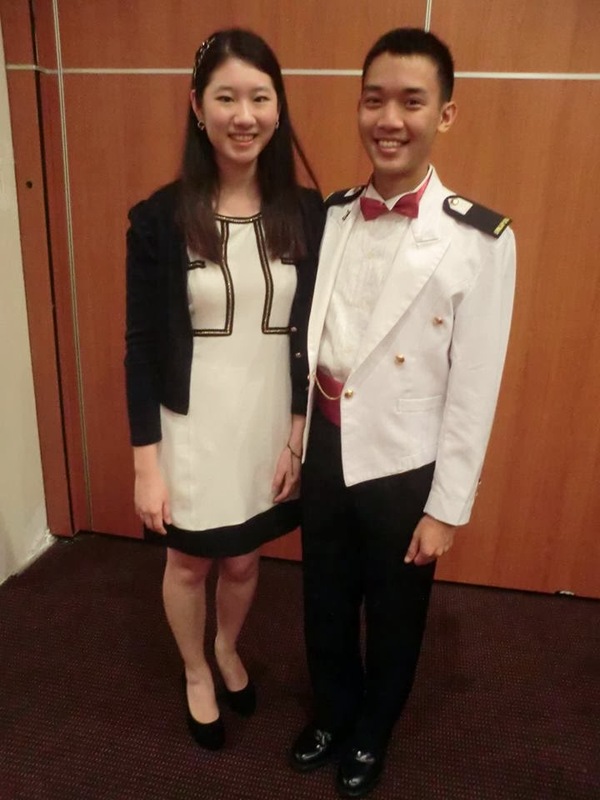 We wish Shuan all the best in the next 2 years of National Service and may he give heed to the advice of Mr Chan Chun Sing! I will accompany him to report to the training centre at Tekong island in the morning and see what I can share later of the facilities that will be viewed in a planned tour for visitors like me. 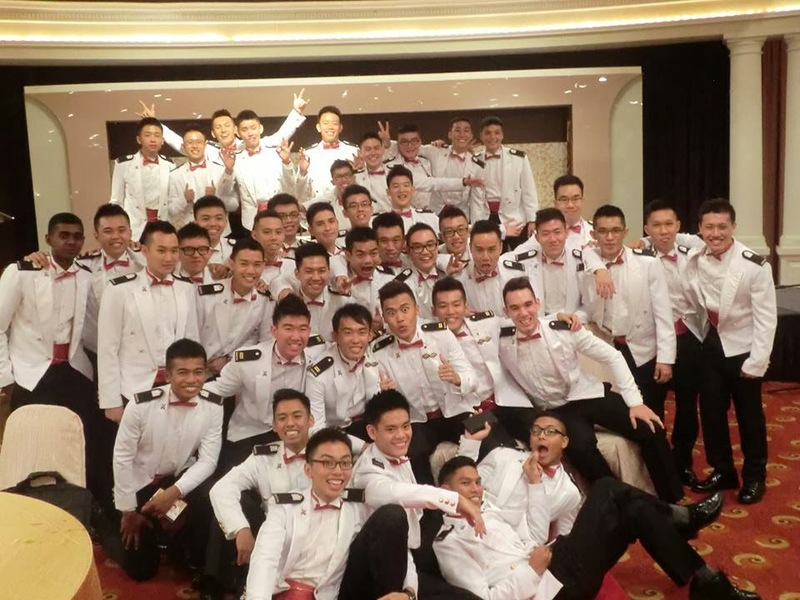 I was told on the last weekend before Saturday 12th October 2013 by Private Chong, being the date set for the Basic Military Training (BMT) Graduation Parade, that all of the recruits will have to pack everything that belongs to them to fit into their back packs by Friday night. Then from the Tekong site, they will march in the middle of the night with a full pack to the graduation site, being the longest march they would ever have had ie a distance of 24km to reach the Marina Bay Floating Platform where the 'Passing Off' for all the recruits will take place. Here I am packing a full gear myself in KL but not marching to Singapore but driving off in the middle of the night to the same final destination, praying for my son that he doesn't 'Pass Out' before he gets to 'Pass Off' at the spectacular floating platform in Marina Bay! Full report to be covered here soon! I may get some time to 'pass out' at the rest stop off the highway but not too long or I will miss the 'passing off' parade of my son!!! Pray for the both of us!! Looks like all the boys made it as they were all gathered smartly on the floating platform in Marina Bay with their full back-packs! How beautifully they marched out of the floating platform! Hurrrrrrrrrayyyyyyy the Boys are now Men as they throw their caps in the air to celebrate!!!!!! The soldiers and crowd went crazy!!! What a BIG MESS of PEOPLE!!! The Father and Son did it!!!! Knowing he is from Kestrel company does help! I can feel that his Mom is also very happy over the day's event! 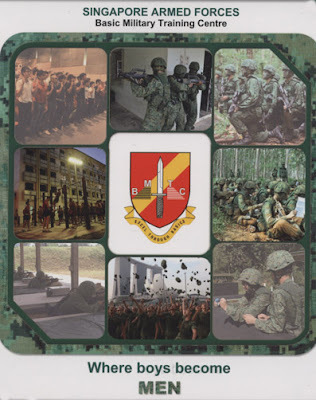 While back in KL on the following weekend of his graduation for Dad's school/class reunion function, I received an email from Private Chong of the announcement of his posting to Officer Cadet School (OCS) that he had just received! This is great news which means not only did he pass the physical fitness tests well during his Basic Military Training (BMT) but was judged to be able to have a good head as well to make quick or responsive decisions to qualify him for this OCS posting. This would mean that he will be entering the elite course to be trained as an officer that will lead to a promotion in his rank with higher pay when he eventually is posted to a selected division of the arm forces ie the land, water or air, after he graduates from the OCS. From the letter, we can tell he has been selected to be trained under Air Wing Platoon 2. There will be further postings here, after the family day visit, as then only will I get to know more about the Officer Cadet Course and gain a better understanding of OCS and what will be the experience for Shuan. They also now get a nicer black bag to carry home by hand grip with no shoulder straps, so as to look smarter wearing a new white long sleeve shirt and black pants attire which I can only photograph the next weekend when he comes home! There aren't any green colors in the attire and no sewn-on military patches as in his previous uniform to go home in but has a small pin on his collar I was told. The two trainee officers in the room have their own study table with individual laptops provided with wifi access. Looking on, reflected on the wardrobe mirror, is our close family friend John Lee whose son had been through here before in the army. 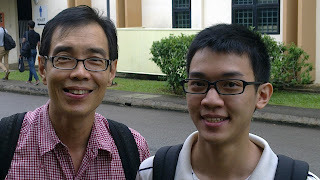 John was a helpful guide to get me to the OCS in the Jurong area fast from our Church meeting. We're in the laundry room where he shows us the other colored apparels used for exercises or sports that they are provided. We're looking at the secured door with huge pad locks where their guns of all officers are kept when not used by them. After inspecting all sections of his quarters as seen above, we proceeded to inspect other building as the VIPs for the day! We went up a tall narrow tower where the Officer Cadets normally have to run up but we could use the elevators. Unfortunately the tower can be viewed only in the video below that I shot of it. This is how high up we were like in an aeroplane to see the view below of the grounds where the officer cadets commissioning parade for the OCS will be held. The Jungle Confidence Course is a gruelling 9 day course that all Infantry Officer Cadets go through as part of their overseas training. The course consists of navigating through dense forests, thick vegetation and erratic weather and is conducted in tough, unfamiliar overseas terrains. Additionally, there is a survival phase where they are left alone and will have to survive for 3 days with only the most basic of tools. The last phase of the Jungle Confidence Course is a race against time to trek back to camp after enduring 8 days of mental and physical trials. The cadets are deposited on random sites and are expected to navigate back to camp. They are assessed based on the time they take to reach back to camp. After the Lakiun Camp, Shuan was sent to Thailand where he had to face hot weather for further training. 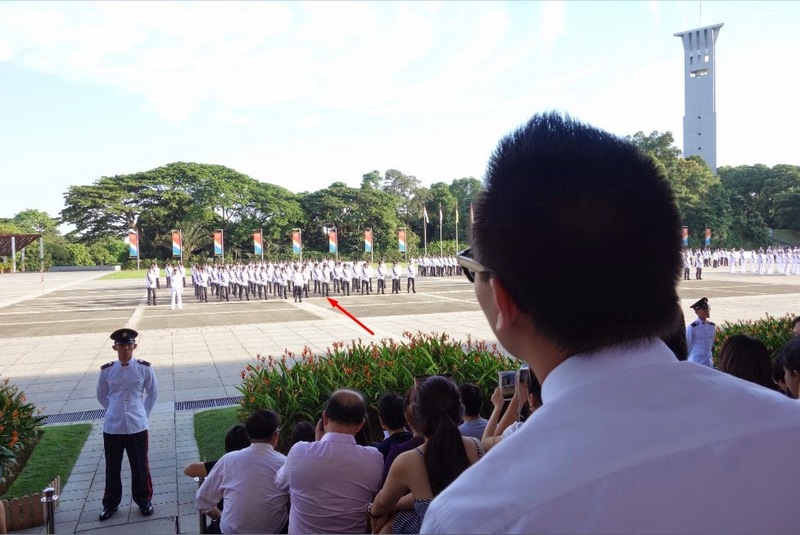 9 months go by very quickly and it's time for Shuan to have his Officer Cadets Commissioning Parade at the SAFTI Military Institute premises in Jurong. 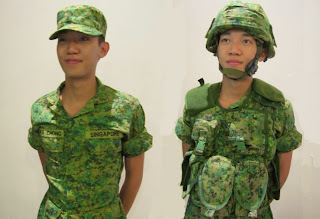 He has gone through tougher training as an officer than the others non-officers who have continued their national service 9 months earlier who were already assigned or posted to serve in the various divisions of the armed forces of Singapore. 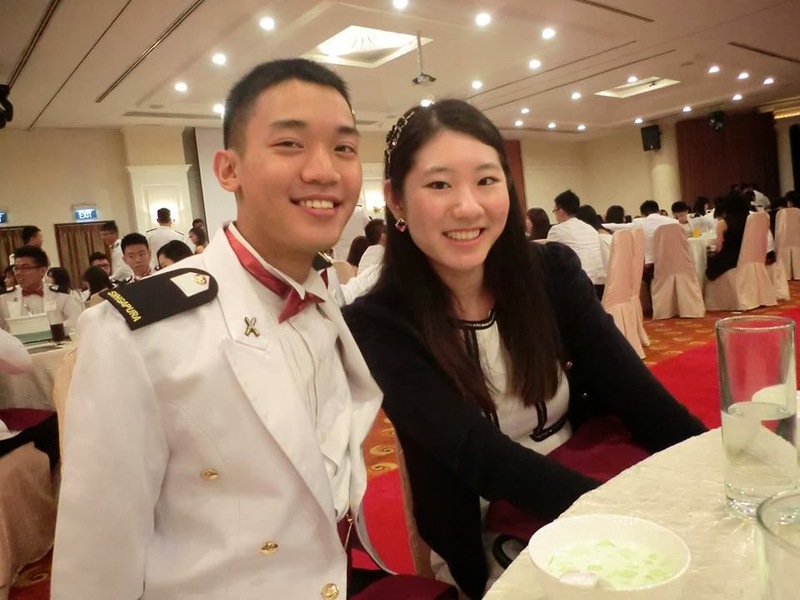 He will be commissioned as 2nd Lieutenant and will be posted to be a platoon commander in the Basic Military Training Centre (BMTC) on Tekong island where he was first trained as a fresh recruit. He will now be in charge of training new recruits sent to the BMTC. 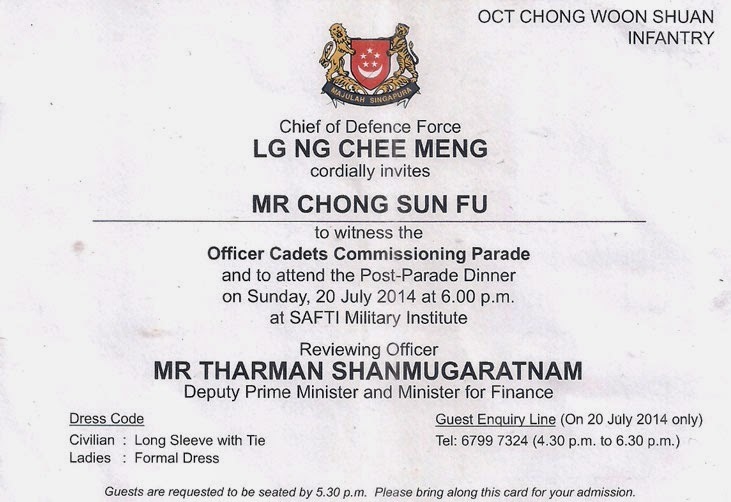 There was a personal invitation card for me to witness the Officer Cadets Commissioning Parade at the SAFTI Military Institute which includes a dinner for parents. Han our oldest came representative of mom. Shuan had informed us where to sit exactly to be right in front of him. He is the 6th person from the right in the front row of the 1st contingent of the parade ie the group to march out first. 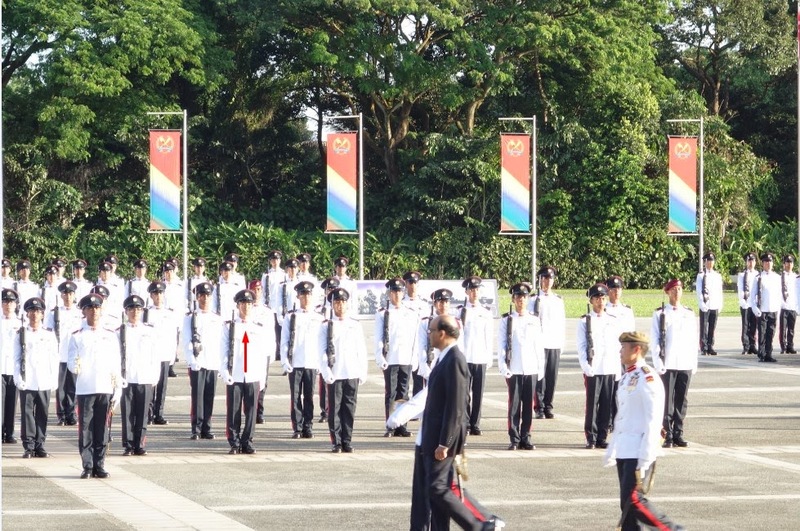 Seen is the tall Mr Tharman Shanmugaratnam, Deputy Prime Minister and Minister for Finance making his inspection of the parade starting with the 1st contingent. 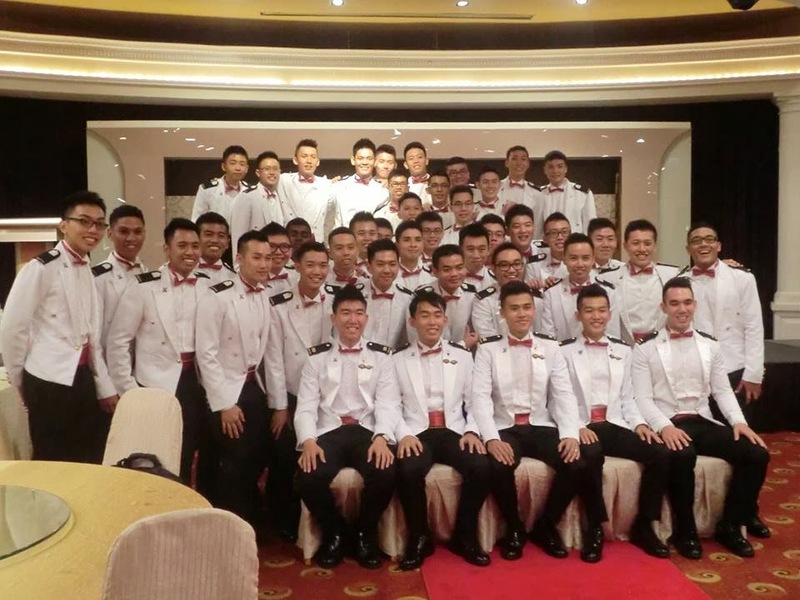 You can see 2nd Lieutenant Shuan Chong in the front row with the arrow. In the video of live marching, always count no 6 from the right in the front row or starting with the cadet officer with the red beret at the right end to know where Shuan is! Towards the end of all the marching in the parade, all the cadets stood still on the parade ground to allow the parents and family members to walk up to them to remove their cadet rank on their shoulders to replace them with the new rank with a single stripe representing the rank of 2nd lieutenant. We had done it for Shuan as recorded in the video below. We took a quick group photo of all of us together with Shuan before having to clear the parade ground for the final part of the commissioning parade celebration! The commissioned officers all had to repeat the officers creed out loud before going into full celebration mode kicking off with the tradition of throwing their hats up high in the air! The video action of the throwing of hats can be viewed here. Watch the video below to see the action, excitement and cheers of the crowd for the new officers of the Singapore Armed Forces. The special post parade dinner will also be covered in the video. See the special surprise close to the end of the video that will amaze you of love in Singapore! Small world for Han to find that one of the violinist providing the music for the evening is from his old ACJC school. 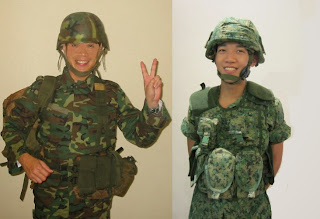 The Lieutenant in the army completed his service to his country faithfully in 2016, saved enough money to pay his own way to serve a voluntary 2 year missionary service for his Church. 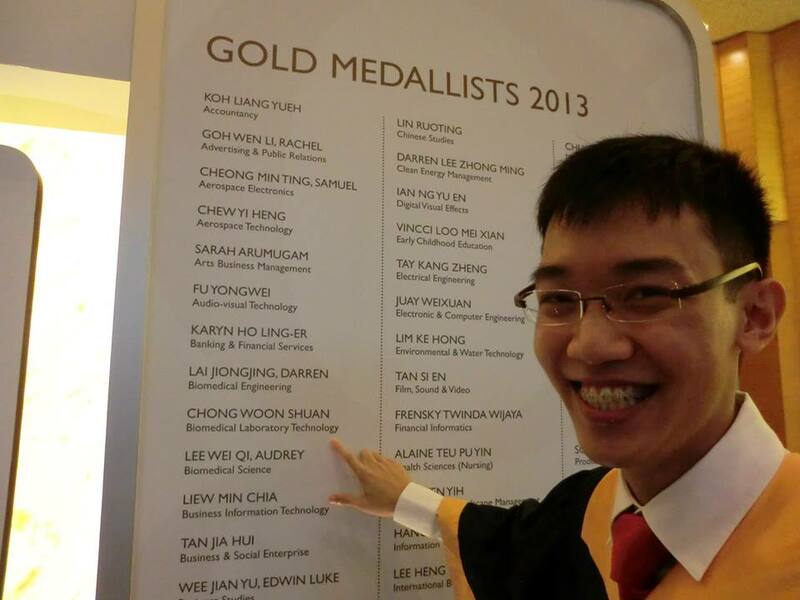 He couldn't leave the country without being forced by the Singapore government's legal control to be a citizen of Singapore first, else he had to pay back for all his subsidized tuition fees since he transferred to Singapore to become a PR when the base of our family moved to Singapore in 2007. The account of Lieutenant Chong receiving his mission call to become Elder Chong is found here.